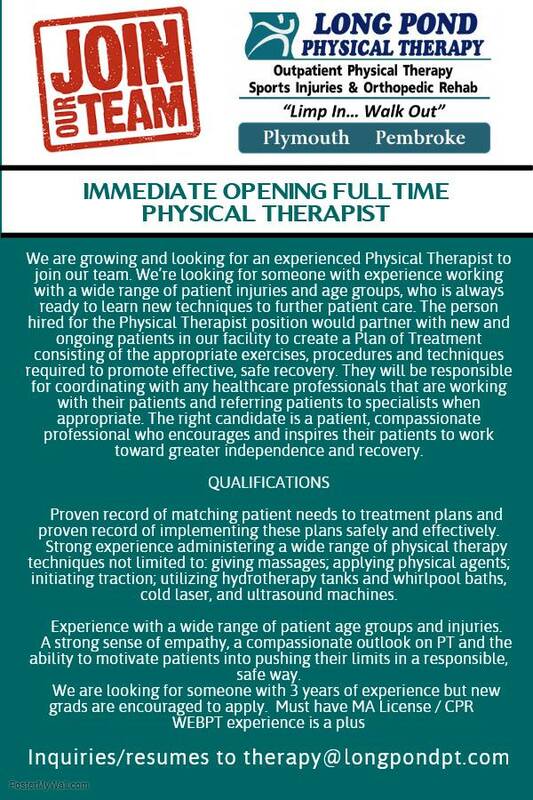 We are growing and looking for an experienced Physical Therapist to join our patient rehabilitation team. We’re looking for someone with experience working with a wide range of patient injuries and age groups, who is always ready to learn new techniques to further patient care. The person hired for the Physical Therapist position would partner with new and ongoing patients in our facility to create a Plan of Treatment consisting of the appropriate exercises, procedures and techniques required to promote effective, safe recovery. They will be responsible for coordinating with any healthcare professionals that are working with their patients and referring patients to specialists when appropriate. The right candidate is a patient, compassionate professional who encourages and inspires their patients to work toward greater independence and recovery. This job is full-time that comes with medical, dental, vacation, retirement, paid continuing ed, and other ancillary benefits. ← How will I recover from ACL surgery?